“As a Christian I do not believe in death without resurrection. If they kill me, I will be reborn in the Salvadoran people,” said Salvadoran Archbishop Oscar Arnulfo Romero in March 1980. A few days after Monsignor Oscar Romero pronounced these words, a member of the Salvadoran National Police did kill him – at the altar, in the middle of mass. On Tuesday, progress was made toward official church recognition of one of Latin America’s greatest leaders in the struggle for the rights and dignity of the poor. When Pope Francis ruled on Feb. 3 that Romero was a martyr – someone killed for his Catholic faith – he opened the door for Romero’s beatification, which could happen in a ceremony in San Salvador within months. 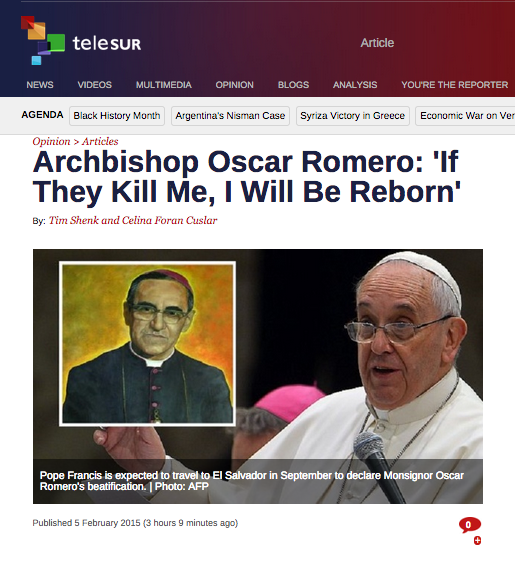 As many news sources, among them TeleSUR, have competently shared details and salient facts about the Pope’s announcement, perhaps we may proceed quickly to a deeper look at Romero and the material reality that shaped him. Who was Oscar Arnulfo Romero? What transformed him from a bookish, status quo priest into the fearless prophet who denounced the behavior of national and international elites and demanded a preferential option for the poor? Romero’s life and prophetic voice were forged through contact with the suffering – and the powerful organization – of “the least of these” in El Salvador.